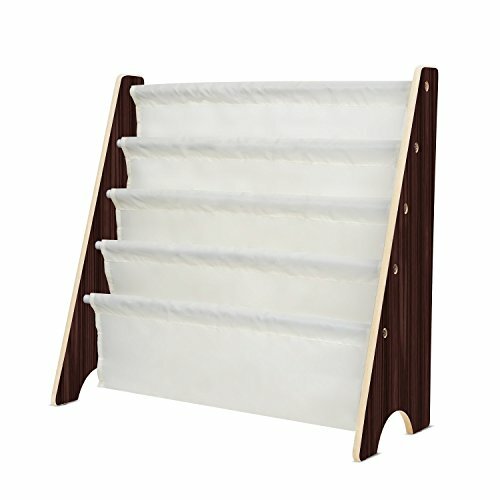 HOMFA Kids Book Rack Storage Sling Bookshelf Toy Display for Children, Espresso / White by Homfa at Indsight. MPN: unknown. Hurry! Limited time offer. Offer valid only while supplies last. ▶Why buy from Homfa Superior Material: ✔Not a huge book shelf but it holds quite a few books,this is a great little bookshelf for your toddler. ✔Not a huge book shelf but it holds quite a few books,this is a great little bookshelf for your toddler. ✔The Homfa sling bookshelf is made of high-quality MDF Board and fabric pocket material,sturdy enough and well made. Easy to assemble. ✔The bright color design can attract kid's attention and keep children's books organized neatly. ✔Providing young children easy access to books.Encourages them to "read" and return their books for a neat and organized room. ✔This kids bookshelf is very cute and compact which meets the purpose of storing little books,light enough to move from room to another room. ✔It's great for your kids to be able to pull books out on by their own since the book organizer allows books to be displayed by the front or back to make them easier to identify by kids. If you have any issue or anything wrong with our product after few days of using ,please be feel free to contact us via homfaservice@gmail.com, we will try out best to solve it . HIGH QUALITY MATERIAL:Made of high-quality MDF and polyester fabric material,with sturdy engineered wood construction,the children's book rack is durable enough and easy to assemble. MULTIPURPOSE:This kids book display rack provides easy access to books for children ages 3 and up,which allows them to reach in and grab their favorite book,promotes organization and reading skills. NICE LOOKING AND PRACTICAL:With the innovative design, the sling book rack allows books to be displayed by the front or back to make them easier to identify by kids. SPACE SAVING DESIGN:This toddler bookshelf is very cute and takes up little space,perfect for book storage in the corner of your toddler's bedroom,playroom,nursery,or the living room. KIDS BOOKS RACK DIMENSIONS:24.4*10.4*24 inch;Depth of each layer:10 inch,Load capacity:22lbs.